Hear a thunderous buzz outside your window? Notice a large dark cluster of insects suddenly hanging from a tree branch, fence, ladder, or woodpile in your backyard? These are swarming honey bees. Want to know what to do with them? Please, whatever you do, don’t kill them — many of our beekeepers would be glad to move them to a new home for you! In fact, chances are an eager beekeeper will show up within hours of your call. People often become concerned when they find swarms clustering in their yards. After all, it’s a lot of bees, and bees sting, right? Actually, honey bees most often exhibit defensive behavior near their nests, where they are concerned with protecting their young and food supply (honey!). A honey bee swarm has neither young nor food stores and isn’t likely to exhibit defensive behavior unless unduly provoked. Honey bees can create colonies within walls, roofs, chimneys, and any other dry cavity. Colonies should be removed promptly from problem sites because honey bees can store an astonishing amount of honey in only a few weeks. Some of our members offer professional honey bee removal services. A. Don’t panic: bees in a swarm are universally in a good mood. They can’t easily sting even if antagonized as they have gorged themselves with honey and can’t get their bodies into the best position to sting. If the swarm is not causing a nuisance, leave it alone or find a beekeeper to come take the swarm away. If the swarm is not captured and removed, it will cluster in a bush or tree and remain there for up to three days. During that time scout bees will search for a suitable location for the swarm to establish a new hive. Q. Why do honeybees swarm? A. Honeybee colonies swarm when they have outgrown their nest site. The existing queen and approximately half of the bees will swarm from the nest and seek a suitable location to build a new nest. The remaining half of the bees will stay in the current nest site. Shortly after the colony swarms, a new queen bee will hatch and, if she successfully mates, will perpetuate the colony until it again swarms. Q. How do beekeepers catch swarms? 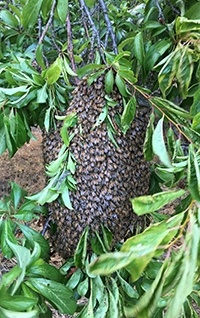 A. Beekeepers usually catch swarms when the bees collect on a tree or bush. The beekeeper simply shakes the swarm into a cardboard box that can be secured and has adequate ventilation. The swarm is then taken to a hive, the box opened and the bees shaken into the hive. Alternatively, the box can be opened in front of the hive for the bees to enter it by themselves. It is a dramatic sight to see a swarm marching into a new hive!